50 Posts Tagged "using wp"
Let me join the Jim Groom Kum-Ba-Ya I Love WordPress Chorus. In this least year, I’ve rolled out 3 NMC web sites that are published via WordPress, with each one going deeper into the bowels of the templates and just more jazzed how I can bend them to my will, casting CSS, PHP, plugins, MySQL to do my bidding. This is unlike drupal, where after a year I am still trying to figure out just how the heck it works and manages information. Its still a grey murky, opaque blue gumdrop box. I am trying to summon the drupal love, and it aint happening. But WordPress, you make me sing. In this blog post that portends to be a monster one of length, I am going to dissect a new site I worked in gory technical detail. On each of these sites, I have started with a standard template and slowly ripped the guts apart. So far, in the stable, is the NMC Campus Observer which began as the Blix template. Then there is NMC Virtual Worlds a child of the Orange 2.0 Theme, and one where I learned to create multiple page templates, use custom fields to spawn content specific sidebars, and rolling my own database queries to get posts I really wanted. Our podcast site, NMC Conversations is probably the least modded, a few tweaks of the redoable theme. So as I get closer to the details, I remind you the stuff I am talking about is what you can do with your own code on a hosted server; while the WordPress.com service is fabulous (I used it myself this year), its simplicity comes at a price of severe lack of template tinkering. You really cannot do much there. 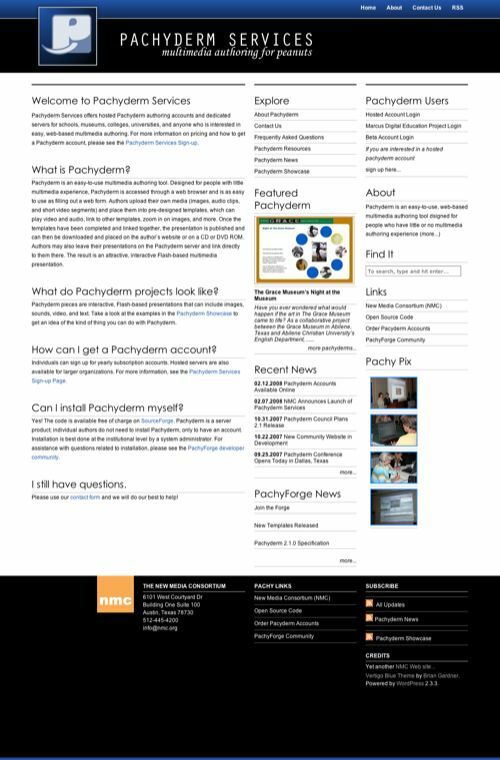 The site I am going to talk about is the NMC Pachyderm Services web site, which replaces a static HTML tabled encrusted, hand code the navigation links” Pachyderm.org web site, which was not all that bad, but once you go to database driven template sites, it just hurts to hand code an HTML site. So I am going to talk alot about the mangling I did in the templates along with some plugins I deploy (and tweak too). I should say I go about waist deep into the CSS and full body dive into the PHP code of the templates. And for some of these sites, I make a bend away from the standard format of blog as reverse chronological series of “posts”. I make web sites, not blogs. Some of this stuff may get nitty gritty in detail, but I am intrigued to see if I can document all the little pieces that came together for this site. To be honest, these really develop organically, and sometimes change/evolve with more content dumped in. WordPress Plugins are awefully powerful to let you easily add/subtract functionality form your own hosted WP site. But sometimes, they become a marriage that may be difficult to extricate yourself. 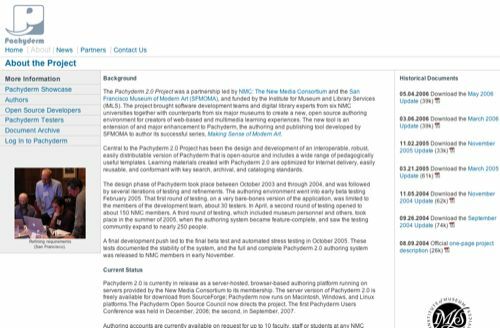 For the NMC Campus Observer, our WP powered site for our Second Life antics, since its inception on March 2006, I had used PodPress, a rather full featured plugin to handle the embedding of audio, sometimes video. It has a huge list of features, and if you have ever looked, adds a lot os “stuff” to your pages. It has a lot of updates, and each replacement is a not so moderate upload of scads of files. Adding the audio/video content is not done via editing your content, but via a separate editing pane. But more problematic, I’ve had numerous incidences where the site’s display was mangled on certain browsers– sometimes Safari lost a sidebar, more recently the site was totally wrecked in Internet Explorer, the sidebar pushed down to the bottom, bottom of the post/comments field cut off. If I disabled PodPress, the display issues went away. But then also, did all of my links to the media. And one of the recent WordPress updates seemed to have a conflict with PP as well. So its been on my list for a while to get myself out of this relationship. I have been using Anarchy Media Plugin on other sites which is one with less overhead, no mucking of display (well I did discover the Gregarious plugin has a conflict that disables Anarchy), but better it works simply by replacing a simple hypertext link to your mp3, .mov, etc with a player icon. This way, should you ever move to another plugin, your content is in tact. If you are looking for a simple plugin to just convert mp3 links to a nice small player, I like Taragana’s Del.icio.us mp3 Player WordPress Plugin. So the task was I’d have to find every post that had a PodPress managed media, and rewrite the post to have a normal href link that Anarchy could pick up.